Getting prepared for an emergency can be daunting. It isn’t quick and it isn’t cheap. When you consider the likelihood of needing to use these things you store, it can be hard to dredge up the motivation to actually do it. The fact is, however, that you can’t prepare after the emergency and emergencies just don’t give you fair warning. You need to prepare. When starting your emergency preparedness, it is wise to start with water. 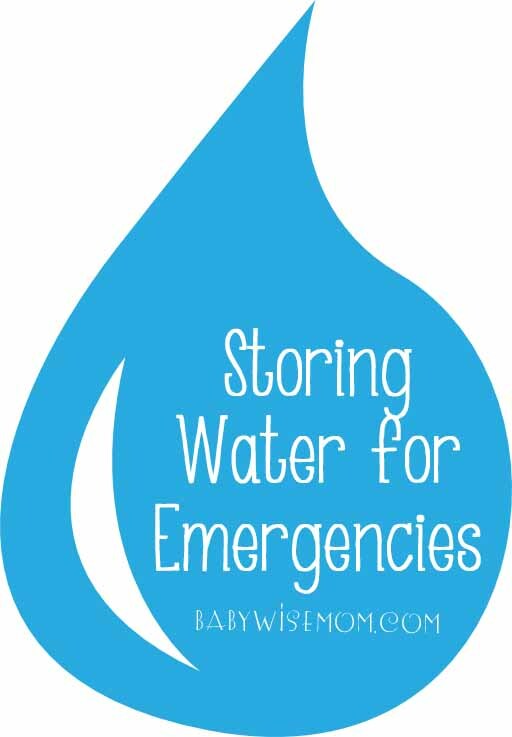 Storing water can be pretty inexpensive. It also is very necessary. You can only survive 3 days without water. As a parent, you aren’t going to be able to curl up in a ball and wait it out and hope water comes soon. You will need water so you can take care of your kids. You children also need water. Have you ever been trapped in your vehicle with thirsty children and no water? They really seem to think they are going to die needing to wait another ten minutes until you get home and can give them water. Thirsty children are not fun. You don’t want to be stuck without water. This post contains affiliate links. It is a great idea to have water on hand at home for emergency use. Unfortunately, the need for this seems to come up more often than just a natural disaster. The water can be shut off to your neighborhood for various reasons, from an accident to maintenance. You can also get into a situation where your city’s water is contaminated. This leads to not being able to use your water for typically 1-3 days (sometimes more). So I suggest you store water at home. You can keep store-bought bottled water in your storage. You can keep some water in your refridgerator. This obviously would not help you out long term, but if your water-main was shut off for a few hours, it could get you through that. You can store water in containers. We have a 55 gallon drum of water in our storage room (pictured below). You can buy ccontainers made for water storage (pictured below). You can also simply save old 2 liter bottles and store water in those. You can store a water filter. We own a LifeStraw Family 1.0 Water Purifier. This is pictured above. It “Purifies 18,000 liters/4755 gallons WITHOUT iodine, chlorine, or other chemicals; Clean drinking water for a family of four for 3 years”. You can find water from the rain, in rivers, in ponds, from streams, melted snow…this will enable us to purify water if we need to. In reality, storing water at home is the easy part. Having enough water for your use at home just takes a bit of forethought, planning, and work. It isn’t too difficult. Trying to figure out water for a portable 72 hour kit is the real trick. You need one gallon of water per person per day. That means for a 72 hour kit, three days, you need three gallons of water per person. Can you imagine stuffing three gallons of water into your 72 hour kit and then carrying that around on your back? I try to make our 72 hour kits so we can each individually carry them in case our transportation is our feet. Three gallons of water is heavy. Here are our solutions. We started with water pouches. We put one gallon in each person’s pack. One gallon was enough to make it seem heavy–especially considering that water isn’t the only think you are packing in your 72 hour kit. I want us to start off with guaranteed water. I figure the first day of needing to use a 72 hour kit could potentially be the most stressful and this way we won’t be desperate for water immediately. I did some digging and came across the LifeStraw. This is how I found the family filter I talked about above. They also have Personal Water Filters. This was a Time Magazine invention of the year winner. You can use this straw, stick it directly into dirty water, and drink through the straw. It is extremely light (less than one pound). Each straw filters 1000 liters. I put this and an old water bottle in each person’s pack. This way we can fill up a bottle for the kids to drink from so they don’t have to lean over the river or pond to drink. I think that would help mentally. Also, we could take water with us if we were moving away from the water source. You can also follow our BFBN Emergency Preparedness board and our Safety board for more tips. You can also see my Emergency Preparedness board for tips. Today the ladies of the BFBN are all sharing safety tips. We have everything from carseats to babyproofing. Be sure to check them out! Those LifeStraws look awesome! Thanks for the tip! I know wasn't that a great find?!? You are welcome!